Beet hummus is made with oven roasted beets, tahini, olive oil, lemon juice and garlic. It's a vibrant and healthy snack or appetizer recipe. Cut the stems of the beets, leaving approximately 2 inched attached. Wash the beets, lightly coat in olive oil (or avocado oil), place in a covered cast-iron pot or other baking dish and roast in the oven for 50-60 minutes. Remove the beets from the oven and slice the tail and stem off the beets. Add the chickpeas, tahini, lemon juice, olive oil, garlic, salt and beets to a Vitamix or other high-powered blender. Use the tamper and blend for one minute or until smooth and creamy. 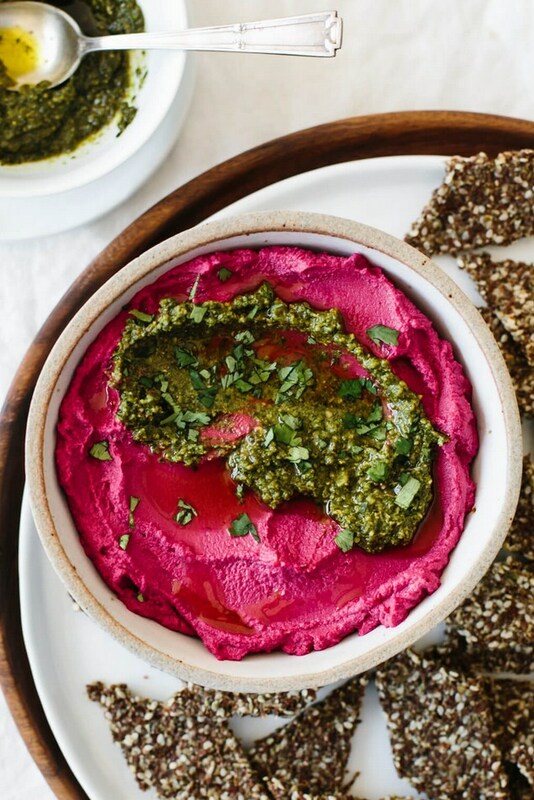 Transfer the beet hummus to a serving bowl and garnish with basil pesto, parsley and a drizzle of olive oil. The recipe makes approximately 2 cups of beet hummus.